A second aid convoy will attempt to reach desperate residents of Syria's Eastern Ghouta rebel enclave later Thursday after weeks of pummeling by government forces and Russian warplanes in defiance of UN calls for a halt to violence. The blistering Syrian government onslaught, backed by Moscow, has prompted international outrage, including accusations by the United Nations that the government was orchestrating an "apocalypse". 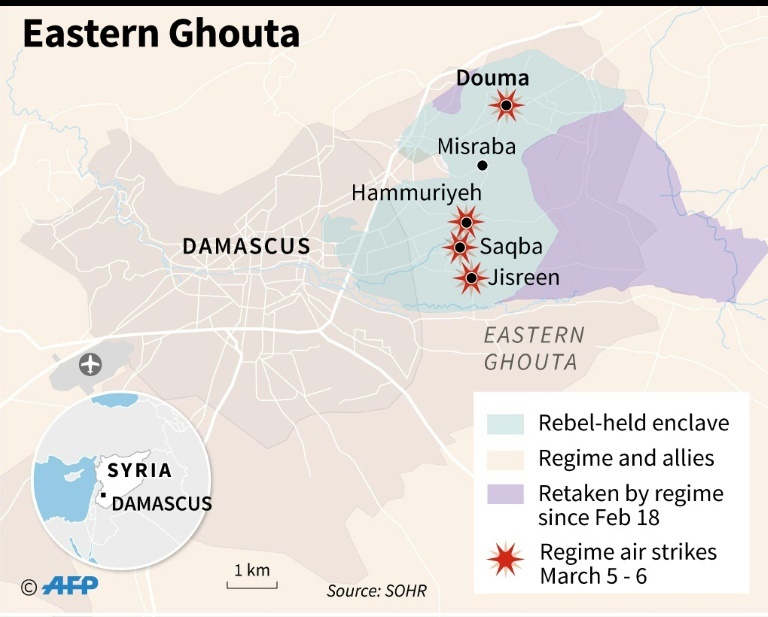 The Syrian army and its allied militias began a fierce bombing campaign on February 18 on Eastern Ghouta -- the last opposition bastion near Damascus -- then launched a ground offensive a week later. The campaign has so far left at least 867 civilians dead, including dozens of children, according to the Syrian Observatory for Human Rights. Towns and villages have fallen in quick succession in recent days with troops taking back half the enclave. The UN has been pushing for aid convoys to alleviate appalling conditions for the estimated 400,000 civilians trapped there. But they have had little success. Nearly half of the food aid could not be delivered while the US said Syrian authorities removed some medical and health supplies from the trucks. UN Secretary-General Antonio Guterres urged all warring sides to allow aid trucks to return for a planned second delivery to the enclave's main town of Douma on Thursday. 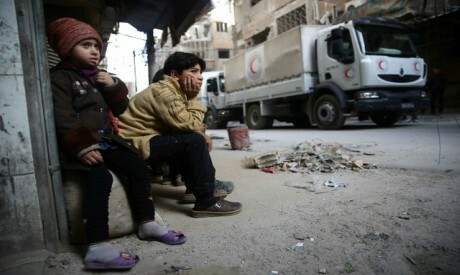 Linda Tom, spokesperson for the UN's humanitarian coordination office OCHA in Syria, said the aid would aim to reach 70,000 people in Douma and would include medical supplies not allowed in Monday's delivery. Wednesday saw renewed heavy fighting break out as government forces captured Beit Sawa, Al-Ashaari, and nearby farmland, the Britain-based Observatory said. Heavy air strikes, mostly by Russian warplanes, left at least 62 civilians dead including four children across the enclave, said the Observatory, which relies on a network of sources on the ground. The council met behind closed doors for three hours on Wednesday to discuss the failed truce, after France and Britain requested urgent talks. UN peace envoy Staffan de Mistura briefed the meeting and offered to help broker a deal with Russia to allow fighters in Eastern Ghouta to leave, a diplomat said, adding that diplomats supported the idea as a way to halt the violence. UN human rights chief Zeid Ra'ad Al Hussein said the Syrian regime and its foreign allies were already planning their next "apocalypse". "This month, it is Eastern Ghouta which is, in the words of the Secretary General, hell on earth," he said. "Next month or the month after, it will be somewhere else where people face an apocalypse -- an apocalypse intended, planned and executed by individuals within the government, apparently with the full backing of some of their foreign supporters." They have opted to flee deeper into the rebel-controlled enclave, despite a so-called "humanitarian corridor" announced by Moscow last week. Russia said it would guarantee safe passage to civilians and rebels wishing to flee the enclave during a "pause" that is meant to bring calm to Eastern Ghouta between 9:00 am (0700 GMT) and 2:00 pm. No Syrian civilians are known to have used the "corridor". The two main rebel groups in Eastern Ghouta -- Jaish al-Islam and Faylaq al-Rahman -- deny the exit routes or the pauses have been coordinated with them. "There is no communication with the Russians, directly or indirectly," said Wael Alwan, spokesman for Faylaq al-Rahman.